Calamari, What a stupid question. if the engine is running and you are going nowhere, you are creating polutution whether there is anyone in the vehicle or not. And I wish drivers would switch off their engines whilst stationary, after all, it is an offence to remain stationary with your engine running. £20 fine rising to £40 if not paid within a time frame. Air polution is as big a problem as is plastic waste. Judge Graham Cottle is a criminal himself. He was once the recorder of Exeter, he was removed from the Exeter circuit for wrong doings and found his way to the Plymouth circuit for a while. He is now back in Exeter but not as the recorder, but as a crooked judge. I have every symphathy with the mum who is against his actions. 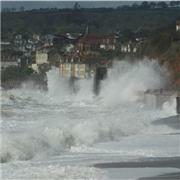 Someone is going to have to protect those villages, towns along the route from Starcross to Teignmouth. I don't think there will be two lots of money available to cover what is suggested and to protect what is protected now. Money from the government is normally only thrown in one direction. But time will tell! What would happen to Starcross, Dawlish and Teignmouth if there was no protection, (which they now have) if there was no rail line? I don't think you will get a lot for 4.5M. Watch the price go up!!!!! !